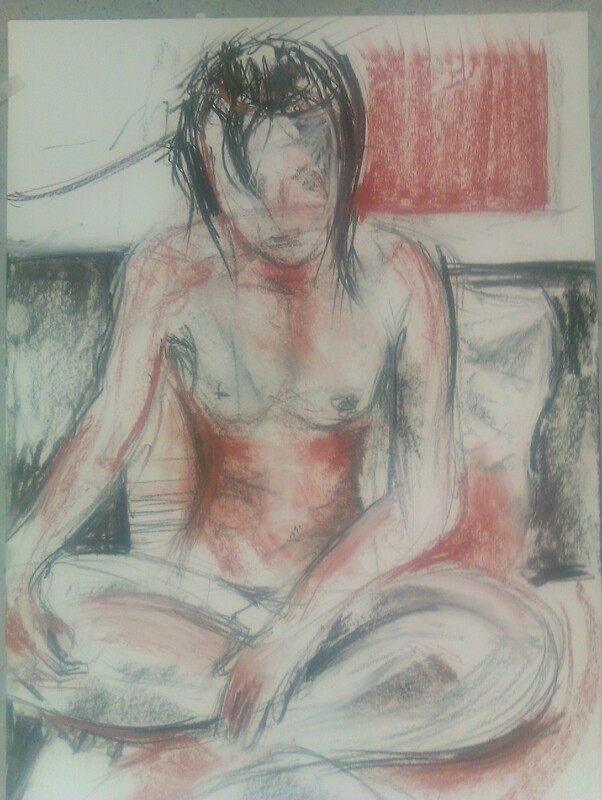 I had an opportunity to cover for an existing life drawing group, as coordinator, and jumped at the chance. This was the RAM (Register of Artists’ Models) audition session on Wednesday 13th January, at Islington Arts Factory. I knew this could be a chance to bring in a bit of Spirited Bodies, as new life models were auditioning, and I used to facilitate this at my own workshops in the past. Where I used to have about 8 models present however (not all auditioning for RAM mind, perhaps just one or two), this was going to be a smaller session. This was on account of the size of the space, and because it was my first time there, I wanted to see how the regular artists responded. Rachel Welch who usually runs the session, arranged for two audition models to be present, and I invited someone who had recently contacted me about trying modelling. All three models were to pose for the first time, and we had two men and one woman. I decided to follow Rachel’s suggested pose time schedule, as it is fairly standard and would maintain continuity for the long standing artist group. I came up with some themes for the poses, and other than that did not have to prepare very much, as everything I needed was at the venue. The space turned out to be bigger than I had imagined, well heated (for a very cold January evening), and with plenty of cushions as well as art materials. There were ten artists – a friendly group who helped me by letting me know where things were and what they are used to. 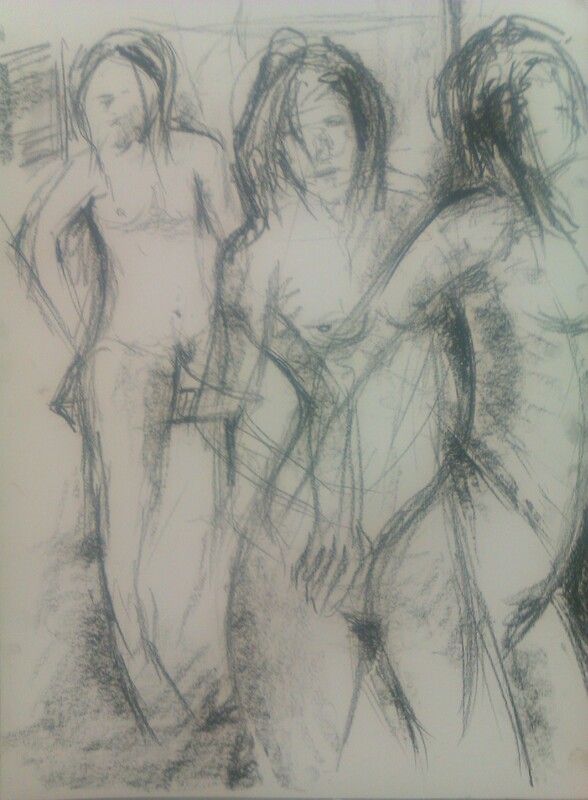 I recognised a few of them from when I have been modelling elsewhere, and at least one had been to Spirited Bodies. 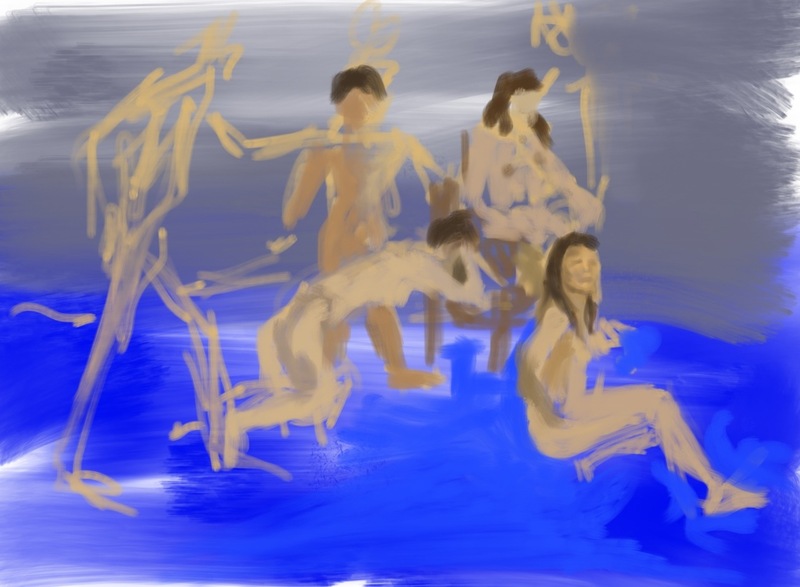 For the first 3 five minute poses, I asked the models to take turns at each creating an expansive, a compact and a connecting pose. The idea was that the model who was connecting, was energetically bringing cohesion to the three, joining the otherwise opposite stances. The models shared a platform, with a small mattress on one side, and some cushions available. I instructed them to pose in different parts of the space and face in alternate directions, whilst maintaining an outside eye myself to check each overall tableau from all sides, as they were in the round. 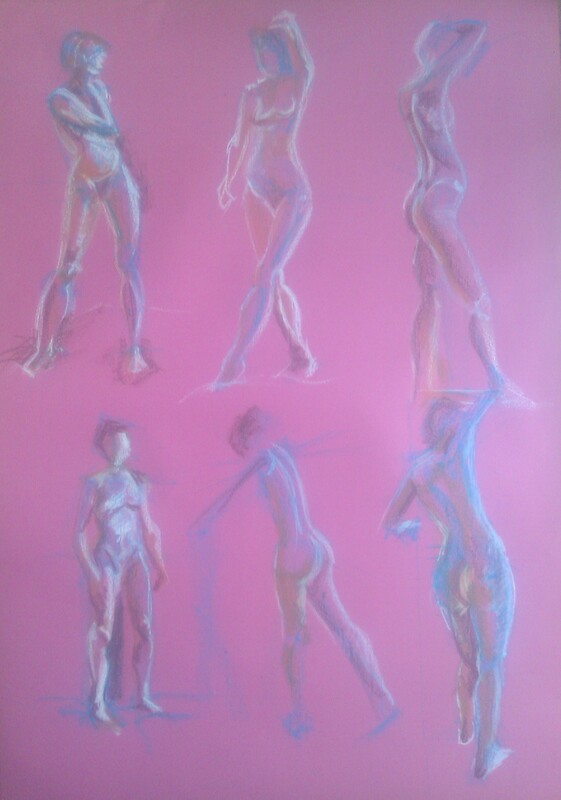 There followed two ten minute poses; the first I suggested to represent some sort of dance, as these shorter poses are more ideal for standing and being a bit dynamic. The second saw them as if casting a spell together, focused on a scarf which they each held snaking between them. 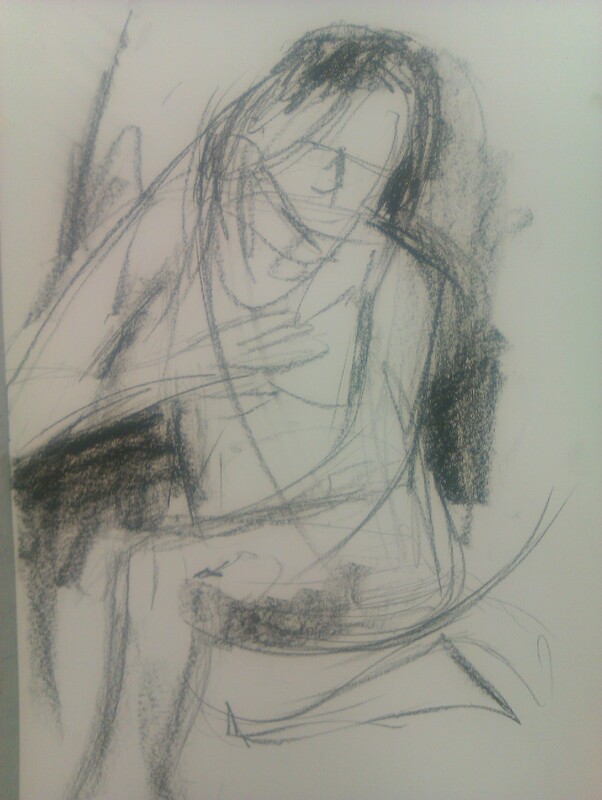 I encouraged them to experiment with levels – whether standing, sitting, crouching or reclining, and to find expressive shapes with their bodies. This sometimes inevitably found them pushing themselves perhaps unexpectedly, a little over-ambitiously. I tried to talk them through their agony, which was evident from the outside – shaking was visible. I have been there all too often, still find myself in such predicaments after many years experience. Each day and every pose is new, and particularly a new space or group, can catch us off-guard. I may feel more energetic than my body is in fact capable of. I know it doesn’t matter though, that rediscovering comfort is important, so I remind the novices of this. “There is a fine line between challenging yourself and torturing yourself; try not to cross that line too much!” I warn. The next 15 minutes becomes an awkward silence – I ask them to pose as if there is an elephant in the room. This is about energetic and atmospheric connection. A pose may be simple, yet convey a great deal of drama. For the final 15 minutes before the break, I ask the models to regard the artists with suspicion; it’s all about the tension, the sternness. They are excelling themselves, and I can really see how one model especially is getting into his flow. It looks potentially painful the way he is leaning on an elbow, with the rest of his body contorted in interesting diagonals, so I advise him to focus on a single point ahead of him. Before this, he had a tendency to move his head around a bit more than is ideal. Focussing the eyes will hopefully aid finding a meditative zone, or moving beyond the pain barrier. 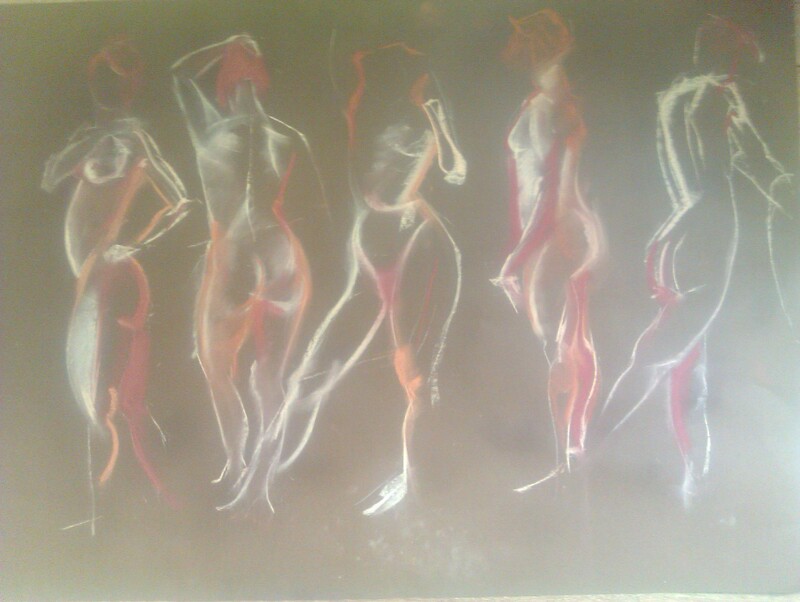 It is a mental exercise and not for all, but worth trying, especially if you do want to be a life model. 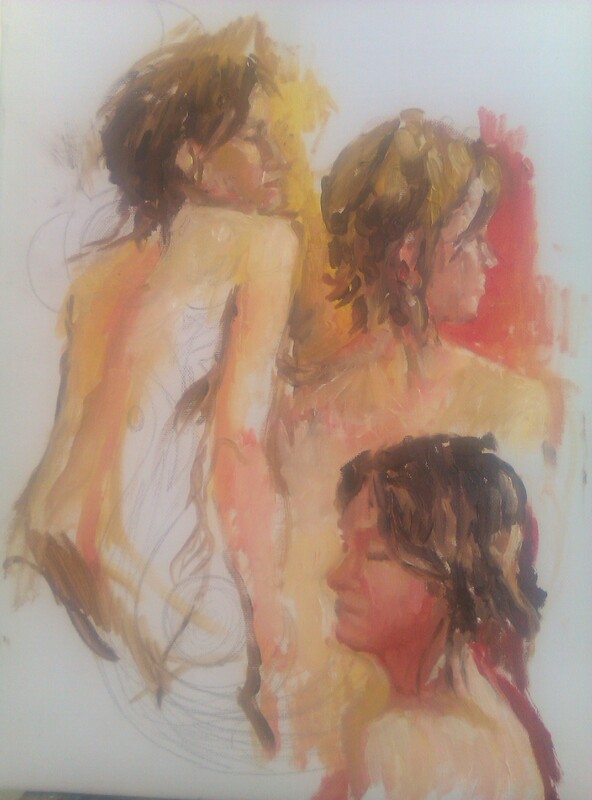 I keep my comments to a minimum, being mindful of the artists’ concentration, whilst trying to sense what will be helpful for models, and artists to hear. I decide not to give a theme for the longer poses after the break, as I think it’s important that the models find their own pose for their bodies, without trying to focus on too much else. For 20 minutes, one is standing, which I remind them can be easier than other postures which make it harder to stretch for body parts being stacked upon and across each other. Another is lying belly down, and one sitting, with considerable poise I would add. “In longer poses we sometimes find a way to secretly move, without the artists noticing. 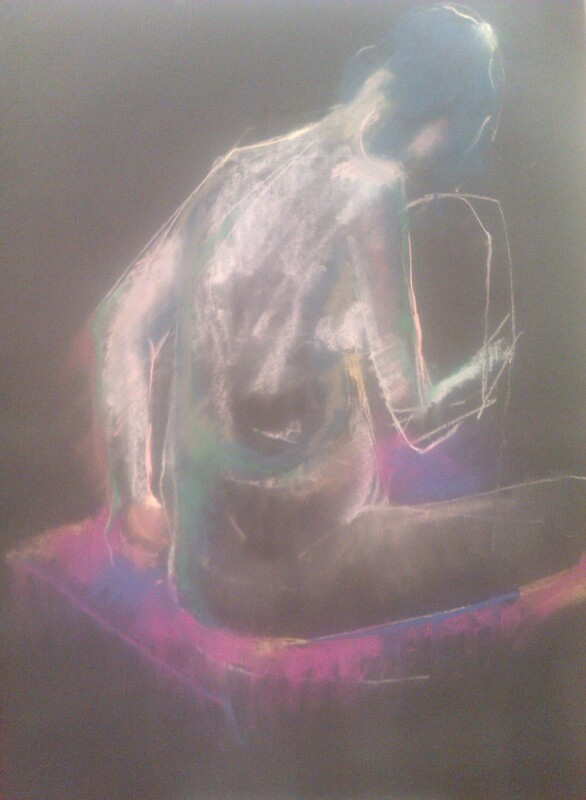 Subtley shifting where our weight is, so that we can have a little break internally, and the artists may carry on drawing,” I mention during a sustained pose. Finally, there is half an hour left for a last pose. 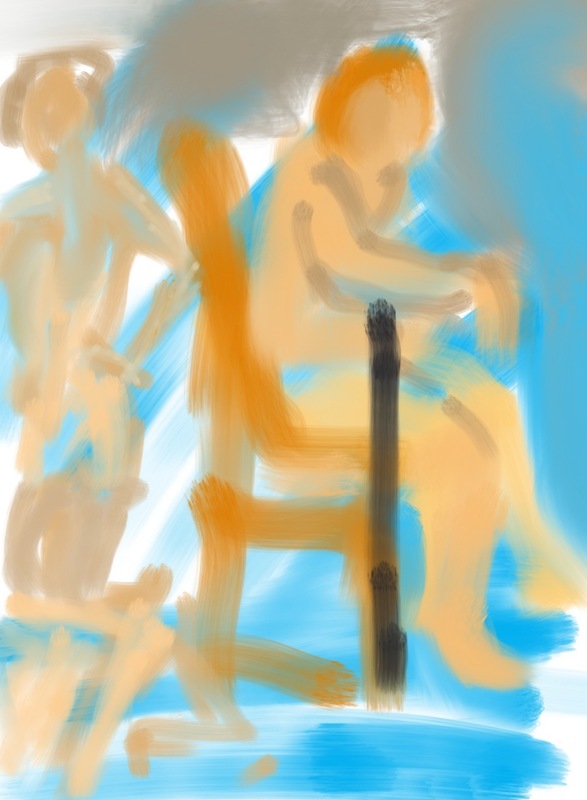 Two models want to stand, and at first the other does too, as he pushed it in a seated pose just before. He then settles, sitting on the corner of the dais upright, alert. I give him a cushion for his bum, having described to them just earlier the varied etiquette around sheets and bodily fluids. It’s a matter of personal choice, often left to the model. As ever in the moment, we models often go with the flow. If we weren’t so relaxed, we probably wouldn’t be doing this. I feel less pressure than when I ran workshops regularly a few years ago, as there’s enough artists here, and they are not expecting to model. It’s the right balance with the necessary reverence towards those posing. Also, I have discovered that with just three student models, I feel I am giving enough attention to each. At the end we give a round of applause to our models, and I ask that we may look at the artwork, which is the first time that these models have seen such. It turns out that at least one of the artists is very shy about showing this, and I think it reminds the models that everyone is nervous about different things. 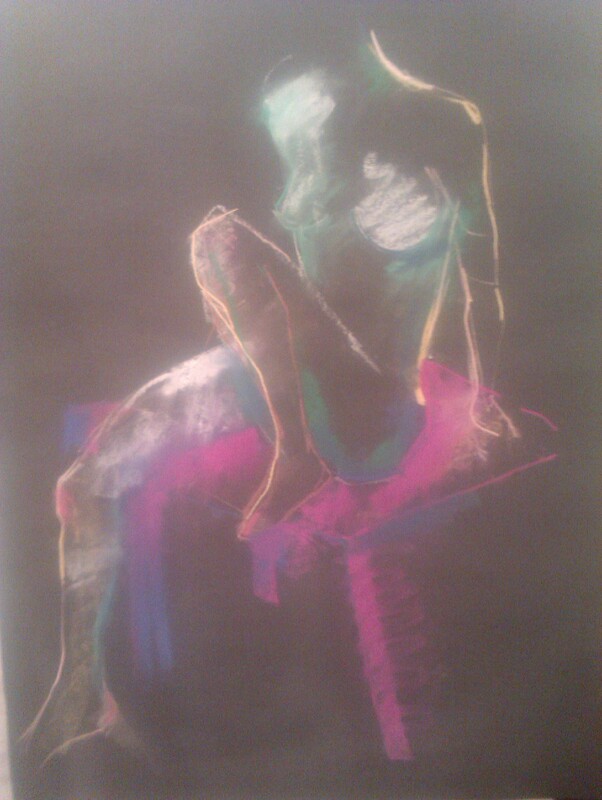 I really enjoyed this evening; it was a genuine pleasure to welcome new models into the life drawing arena. I had taken the unusual step of inviting a new male model, who wasn’t a RAM auditioner. He had contacted me and been informed that I had lost faith in accepting new men to Spirited Bodies. Well I had, for a while. But something told me that with such a small group, and not having to be concerned with finding the artists (which may consume attention), I would be safe (we all would). Plus an instinct about his messages put me at ease. What a relief and even a breakthrough! I had taken care, been watchful, and I will continue with that, in I hope the appropriate measure for each new instance. (Re)building a supportive foundation for Spirited Bodies – women, men, or humans beyond gender.